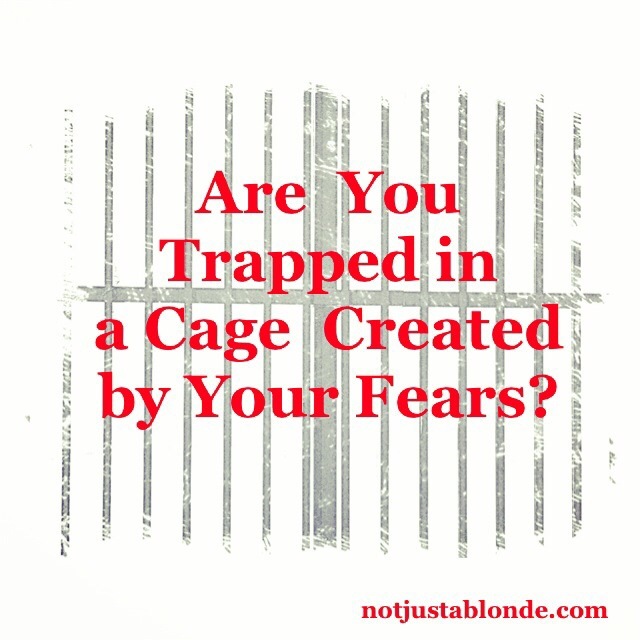 Many of us are trapped in cages created by our fears. We fear many things including: death, other people, the future, even ourselves! Fear is a liar and a thief! It tells us we will be hurt! It steals our time and our peace-of-mind! Fear’s purpose is distraction and destruction. Fear distracts us from our true inheritance and destroys our peace. We can set ourselves free by realizing fear is not real. Fear cannot hurt us. We are safe in the arms of a loving God. By appearing like a friend we mistakenly listen yet fear keeps us in the darkness of anxiety, worry, stress under the guise of protecting us! Fear is an illusion that keeps us from fully experiencing God’s presence in every facet of our lives. Fear is an earthy signal and should be regarded as such. Fear tells us we may be crossing a boundary or that we are going outside our comfort zone, but we should never let fear lock us in. Fear should not enslave us. We must always remember we are free and release ourselves from fear’s grasp! We cannot follow the path God has set for us if we are locked into a cage. Jesus came to free us from fear to experience a life filled with love. Amen – so true. Would you mind if I reblog at AnotherRedLetterDay.com? I believe much of the good news of Jesus is about fear. He tells us that we need not fear the Father; he is not angry with us and he will not punish us in hell. We also need not fear death. Fear is created through the limited mind, it take happenings, stick a label of evil on it and amplify it to fear. To escape this cage, we have to leave our modus operandi, what is a part of ascension. But be aware that the old modus operandi try to sabotage it through fear. The cage door is already open but we fear to fly through it. Thank you Ann. As often happens, God recently showed me something that is relevant here. It was on a program on TV concerning the countryside. It showed a farmer wanting to put his cattle out to pasture after they had been overwintered indoors. He opened the door and drove the cattle out, but they straightaway came back in again, because they had become adapted to their environment. It was not necessarily that they feared the outside, but didn’t want to leave the inside. In a human sense, they had become comfortable where they were and were reluctant to change. There is a (most probably apocryphal) story concerning a church in which the piano had been in the same place for years. The new pastor decided to move it to the other side of the room, but when he did so, his congregation protested so much that he moved it back; however, he moved the piano by six inches every week until it was on the other side of the room where he wanted it to be and nobody protested at all. The moral is that we may be reluctant to change in a single step, but would change gradually if our comfort was not upset. Some changes cannot be made incrementally, they have to be made in a single step. If we know the step that we need to make, but are reluctant to make it, then we need to ask God to help us to make that step. Maybe the asking proves to be the step that God really wanted you to make, because it is you putting your trust in Him, not relying on your own strength. Ann, Again thank the Source. I had no idea where that post was going to at the start of it! OK Ann. Obedience is never dull. It is fun too, with the element of surprise at what comes out.